I was surprised that there wasn’t a beginners category as I know more and more people are taking up the sport of running. Sport England revealed last week that the number of people taking part in athletics (which includes running) weekly has risen from 1.4 million in 2005-06 to over 2.1 million today in 2014…that is one hell of an improvement. Most people would assume that overweight runners would all fit into this category of beginner and someone who was running for weight-loss which doesn’t tell us the whole story so instead I have compiled my own list. They are in no particular order and I am placing no value judgement on them. It’s not about labels but I guess it is nice to know you are not alone!! Anti Runner – We all know one of these don’t we? Not only do they NOT run, they actively discourage others from doing it. Oh it’s bad for your knees, you’re TOO FAT, why would you want to Run?? It is really difficult to convince a non runner to start running, but it is not impossible. The best way to influence them is to just quietly get on with proving them wrong and give them opportunities to change their mind and give it a go themselves. Non Runner – These guys are a little easier to get on board with a little bit of effort. Ok so they don’t run yet, and they probably don’t have much of an opinion on running either way. Running just doesn’t feature in their lives at the moment but that isn’t to say that they couldn’t be convinced. These guys are unlikely to know many runners so probably wouldn’t even know where to start, so why not try to spot these guys and befriend them. When I’m Slimmer – The world is full of these guys. Somewhere along the line that have fallen into the trap of thinking that things will be soooooo much better and easier when they are slimmer. The problem is (as we all know)very few of us ever reach that perfect body. If we all waited until we were slim to do the things we wanted to we would die extremely unhappy and unfulfilled, and dare I say it unfit!! 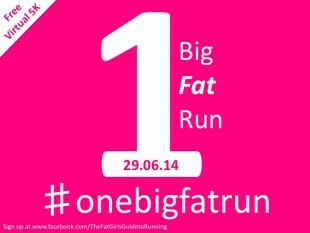 There is no such thing as TOO FAT TO RUN so start today!! Pre Starter – So you have bought the kit, you have read up on how to do it, hey you have even downloaded a phone app to keep you on track. You just haven’t actually started running yet. But that’s OK, because you have committed to starting running and that in itself should be congratulated. Run Talker – Do you find yourself talking about running more than you actually go running? Are you completely in the know when it comes to running terminology, love nothing better than a discussion about the best type of running shoe and when the most exciting races are but can’t remember the last time you actually went for a run? Action speaks louder than words ladies, get out and practice what you preach!! Social Media Runner – Do you run only so that you can update your Facebook status? Are you a member of more than one running communities online? Could it be that you are so busy following other runners and talking about running on social media that you feel like you run more than you actually are? Walk Runner – Most of us stop to walk at some point while out running, but for some this is actually a conscious choice. Following the method devised by Jeff Galloway you choose run walk interval ratios to see you through a training run or race. Injured Runner – We feel your pain. The only thing holding you back is your back pain, your dodgy knees, your shin splints, your plantar fasciitis. All you want to do is go out for a run but know you will only make things worse. So get cross training folks, swimming, yoga, hand weights…just keep active until you are healed and ready to get back in the game. Club Runner – Some of us are brave enough to join a proper running club and some clubs are really inclusive and welcoming of beginners so why not? With regular club runs, active social and race calendars what is there not to like? I hope you guys are actively recruiting and thinking of new ways to make your club even better. Returner – Often called lapsed runner, so you may have been an active runner at some point but have lost your mojo or been off with injury or having babies (us ladies sometimes do you know). Returners will only come back when they are ready though because they know how tough it is to build up in fitness and stamina. They are sometimes a bit reluctant cos they basically know whats to come as they get back into it, but remember there is no time like the present. Old Pro – These guys have been running for a while with hundreds of miles behind them. You may also be a bit of a race addict too, competing in races of all distances and frequently too. You are an inspiration to many because you are living proof that running can become a part of your life in the longterm, and with so much experience behind you what more could we look for in an ambassador for the sport of running. Us runners are a diverse bunch, we don’t need a label but its fun to sometimes look at the characteristics of certain elements which set us apart from each other. And have I missed any more? I’m a returner. I had a baby so I had to take care of her. Now, she’s 4 years of age and I’ve decided to come back. It will really take some time though because I’m now really out of shape. I consulted a trainer friend of mine and she told to it’s going to be tough but I can do it. I hope I can! lol!